Briar Bourne knew it the instant her feet slipped into the cool confines of her lucky ivory slippers and a zing of breathless exhilaration scurried through her. In a matter of an hour, she would have single-handedly launched the family business into greatness. The ton would soon be buzzing with excitement, beating a parasol-armed path to the doors of the Bourne Matrimonial Agency. And all because Briar was about to secure the most elusive bachelor in London as their premier client. But first, she needed to look like a capable and confident woman of the world, and not a debutante sneaking out of her family's rented townhouse. One could never underestimate the power of the proper attire. The right garments could alter the course of one's life, turn a beggar into a shop clerk, a servant into the lady of the house, or—in Briar's case—an underestimated youngest sister into a genuine matchmaker. Since the agency opened two weeks ago, Uncle Ernest, Ainsley, and Jacinda were the only ones with the important occupations. They interviewed the applicants, discovered their interests and beliefs, their hopes and dreams of happily-ever-after. Briar's tasks, on the other hand, were essentially useless. She served tea and filed papers like any trained monkey. She didn't even have her own office. At least, not yet. That was the reason for her predawn errand. She was determined to prove that she could sling Cupid's arrow as well as anyone else. Perhaps even better. After all, Uncle Ernest spent his time wooing nearly every woman he interviewed. Because of him, they had to establish a rule at the agency—never fall in love with the client. As for Ainsley, she was far too pragmatic. All of her facts about the clients were on paper, comparing one list to another. She was blind to the soulful yearning in the eyes of the few people who'd dared to cross their threshold. And Jacinda was far too skeptical. She investigated every client to ensure they were telling the truth, and not hiding dark secrets that could potentially destroy a marriage and family. But not everyone was like their father. The problem with her family was that they were so caught up in their own agendas they didn't realize that a vital component was missing from the agency—excitement. Wasn't falling in love supposed to be the most thrilling of all experiences in one's life? It should be celebrated with wine, showered with rose petals, and glorified with cascades on harp strings. Briar flung herself back onto the bed with a sigh, arms wide, imagining it. She would be the best matchmaker in all of London—no, all of England. Perhaps even the world! 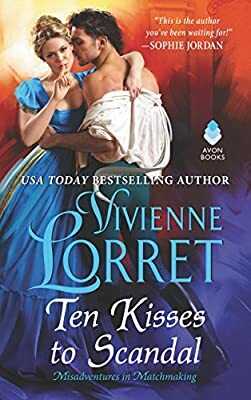 "They simply cannot understand how difficult it is to have such a wild, romantic heart beneath my breast without any opportunity to unleash it," Briar said to the book propped up on the pillow beside her. The red leather tome of Emma—the second volume of three—had been a gift from Mother before her untimely death ten years ago. Mother had adored the story of Miss Emma Woodhouse and her matchmaking endeavors, often wishing that she'd had someone so clever to look out for her. Instead, she'd suffered years of betrayal. In the end, the heartbreak and agony had been too much to bear. And because of that, the Bourne family set out to make the right sort of matches for people based on love, trust, and respect, and to keep others from suffering her fate. "I am determined to do my part as well," Briar said, pressing a kiss to the cover before she stood and fastened a fawn cloak over her shoulders. At the door, she looked back once more and grinned. "Wish me luck."